We love our new garden shoes! Definitely recommend. I bought the Splash shoes for my mother & sister though had to return for one size up, especially to wear thicker socks with them. I got the Premium Clog for myself & was a perfect fit with or without socks. I had a pair of clogs before I bought my garden shoes. 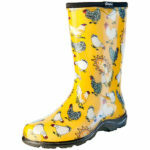 These are much more comfortable and so practical for walking through dewy grass and keeping feet dry and clean. My Sloggers Splash Shoes arrived in pristine order and I am now enjoying having dry feet whilst in the garden. The fit is great & I look forward to them lasting as long as my clogs did, probably 20 yrs +. Many thanks – I recommend these clogs and/or shoes to any other prospective buyers of your product. My chickens love my new Sloggers, my feet are also appreciative. Thanks for prompt service. Would like a rain hat to match. I love the Sloggers but they are a little too small. I bought the largest size but could do with a bit more room. Unfortunately they don’t seem to come in a larger size. Come on Sloggers, don’t discriminate against those of us who happen to be born with bigger feet. Make us some bigger Sloggers. We have let our Slogger suppliers know that there is demand for larger womens sizes – hopefully one day we can offer a larger size for you! Superb service from Gardenware and I’m loving my Sloggers. Use them when cleaning the horse paddocks and my feet are comfy and happy. Easy to clean too. Comfortable shoes, look great and fast postage.